Welcome to The Unofficial Dutch Royal Family Pages! Here you will be able to find all kinds of information about the Dutch royals, their birthdays, anniversaries, succession etc. This site was started on the 11th of August 2004 and will take some time to develop. For what it will look like when completed, feel free to check out one of its sister sites: The Unofficial British Royal Family Pages, The Unofficial Japanese Imperial Family Pages, or the Unofficial Danish Royal Family Pages. If you want to contribute to the site, feel free to contact me (for contact info see the footer of this page). In the meantime just click on the buttons to find out what information is already here! 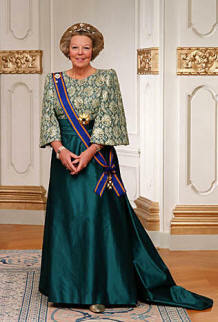 At the left you see a picture of the current Dutch monarch, HM Queen Beatrix. Prince Floris and Princess Aimée have become the proud parents of their first daughter. Magali Margriet Eleonoor was born at 04:37am on Tuesday 9 October 2007. For more recent news about the Dutch and other royal families, click here!